Pure & Secure LLC, through our Pure Water Scientific brand, produces water distillation systems specifically for laboratory use. Our pure water systems reliably and consistently produce lab grade distilled water for preparing solutions, final rinsing of laboratory glassware, rinsing electrodes and rinsing sample bottles. We proudly manufacture our high quality lab distillers in the United States under the strictest guidelines. We also custom make laboratory distiller systems to meet various university, college, government or business specifications. Contact us today to learn more about our scientific line of water distillation systems. Pure Water Scientific systems produce reliable pure distilled water for labs all over the world. Our units are third party tested to be sure that each machine produces the purest water possible. Pure Water Scientific systems are built to exacting standards. Each water distillation system is manufactured in the United States by qualified craftsmen who understand the need for precision. Our laboratory distillation equipment provides continuous purity monitoring. All of the Pure Water Scientific Laboratory Distillation Systems are easy to install and maintain. Our technical team can also help manage the install for easy start up. Units can be used as stand-alone products or as part of a network of distillers to deliver pure steam-distilled water to a variety of locations. If you would like assistance designing your distilled water plant for laboratory use, call or email us and we will be happy to help. The C-50 distilled water unit for laboratory use provides high quality steam distilled water for commercial and institutional applications. The C-50 produces up to 50 gallons per day and has a built-in 50-gallon stainless steel storage tank. 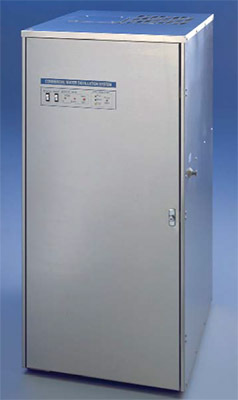 The C-60/75 distilled water unit for laboratory use provides high quality steam distilled water for commercial and institutional applications. The C-60/75 produces up to 60 gallons per day with a 75 gallon stainless steel storage tank and additional features. 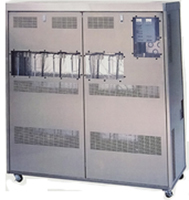 C-630 laboratory water distillation units are in use around the world. From a bottled water operation in Kyushu, Japan, to soup manufacturing in Portugal, to drinking water for a 25 floor luxury high-rise in New Jersey, to a 1.4 million square feet distributor center of a major retailer in Southern California. This patent pending system is a marvel of engineering ingenuity. Carefully designed to work on pressure differentials that impact the boiling point in each chamber. The C-630 boils the water in the first chamber from external energy. Can be wheeled through a standard door for ease of movement prior to installation and can be easily relocated if needed. Designed for easy servicing from just the front and right side - This saves space! Simple operation. Only 8 moving parts. Designed for operation all over the world. No expensive high speed components to wear out. Automatic start-up and shut down.